The Montessori Method and the Reggio Emilia approach are two educational philosophies that many classrooms combine. But how does one blend these two different theories, and what are the results? Grace and courtesy, part of Montessori’s peace education initiative, are among the most important values that the Montessori education curriculum aims to teach students. Learning how to act with elegance and poise when interacting with other individuals has the potential to set students up for lifelong success. As the world becomes increasingly interconnected, languages and cultures are coming together from across the globe, and are playing a crucial role in areas such as business and international relations. Learning and knowing multiple languages, in other words being bilingual, can provide a plethora of benefits. Instilling a second, or even third, language in a child at a young age, can work to spur lifelong success. There are two areas in which children who know multiple languages see benefits: in knowledge, and career success. 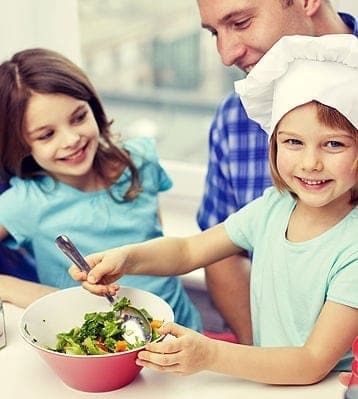 Cooking with your kids is one of the best activities to teach your children practical skills from a young age. Measuring amounts of different ingredients or combining ingredients together are valuable skills that a child cannot learn without cooking. Additionally, measuring ingredients, for example, is an excellent way to begin the process of teaching your child basic math skills like counting and the concept of fractions. Never exposing your child to the cooking process, on the other hand, especially while they are young, will keep them in the dark about how to cook and will make them dependent on you for their most basic need. As the New York Times explains, children who participate in the cooking process, are more likely to eat the food. If your kid is a picky eater, or if they generally don’t tend to finish their plates, involving them in the cooking process can be the first step to fixing that issue. By having your child pick which tomato to buy or what veggies they want for dinner, as well as help with the actual cooking process, they will be more inclined to eat and finish what they helped make. Studies show that kids who help in the kitchen are more likely to be confident and adopt the mindset of “I can” rather than “I can’t”. For most preschoolers, cooking a dinner for a group of people is an intimidating task, however when involved in the process, after helping successfully make dinner, kids will feel a sense of accomplishment. For example, if the dinner menu is homemade pizza, seeing all the ingredients laid out on the counter is daunting but after helping make it, the completed pizza becomes a representation of the idea that anything is possible. Cooking with your kids is a medium to grow closer. In our busy world of work, school, after school activities and different events, time to truly talk to your child is rare. Cooking together, if made an activity that is done together, can allow for time to talk about your days. Talking about your days as well as any other topics that may come up is bonding time that you may not have time for otherwise. We know your days are busy, we know time to spend with your child is rare, but cooking is daily activity that needs to be done anyway, so take the time to cook with your child that will not only be fun also holds many benefits for them. Starting your own business, while exciting, can appear to be a daunting task at first. An aspiring business owner may find themselves wondering where to start or how to improve. Fortunately, the franchise model used by Montessori Kids Universe allows you to not only become the owner of your own business, but a business that has been empowering, inspiring, and educating children under the Maria Montessori method of education for over 30 years. Don’t just take our word for it. Our franchise owners consistently tell us that opening up a Montessori Kids Universe franchise provided them with the tools necessary to succeed, and a rewarding environment to make a positive change and impact in their communities. Additionally, here are the main reasons as to why we believe that opening a Montessori Kids Universe franchise is an incredible opportunity and decision. Montessori Kids Universe is not a typical preschool or daycare center. All Montessori Kids Universe schools successfully use the Montessori and Reggio Emilia based method of education. Through this carefully crafted and time-tested curriculum, child is able to explore their individuality and natural curiosity for learning. Becoming an independent learner is also another essential aspect of the program. A great deal of emphasis is placed on students becoming independent and curious learners, who explore ideas and concepts not because they are instructed to by a teacher, but because they want to. Children in the Montessori Program develop a natural affinity for exploration and a love of learning. One of the major benefits of becoming a franchise partner is having access to the extensive support system provided by our corporate offices. We are able to guide you through every step of the process, ensuring that the establishment of your preschool is an easy and rewarding process. Franchise owners, in addition to having access to the Montessori and Reggio-Emilia curriculum, are backed by a company with over 30 years of experience. First, an article from the New York Times outlines ways in which bilinguals are simply smarter. Knowing multiple languages improves cognitive skills, and even has the potential to shield against brain diseases, such as dementia, later in life. Evidence shows that in a bilingual’s brain, both languages are constantly at work, resulting in an increase in the brain’s ability to resolve internal conflicts, strengthening cognitive skill. The article cites a 2004 study in which bilingual and monolingual preschoolers were tasked with sorting blue circles and red squares into their respective bins, for sorting and organization. The result? The bilinguals not only sorted the shapes by color faster, but also placed them in their appropriate bins much faster than the monolinguals. The article summarizes that studies like these are indicative of a larger picture. Bilinguals have a “heightened ability to monitor the environment”, stemming from having to switch languages often. Due to this heightened ability, bilinguals are more adept at analyzing, solving, and comprehending issues much faster than monolinguals. The benefits of being bilingual extends beyond childhood. The article cites a recent study conducted by the University of California, San Diego, involving 44 elderly Spanish-English bilinguals. The researchers found that those with a high degree of bilingualism, resulting from a high proficiency in each language, were more resistant than monolinguals to onset dementia and Alzheimer’s disease. Learning multiple languages, in addition to making one smarter, can also work to prevent some of the world’s most devastating diseases. To put it simply, the benefits of being bilingual are immense. Second, knowing multiple languages can be the pathway to a successful career, and ultimately, a successful life. Since the world is now more interconnected than ever, interaction with different peoples and cultures is much more common than it was a hundred years ago. Therefore, knowing how to interact with a wider range of people can galvanize one’s ability to not only get a job, but be prosperous in their occupation. According to a study by the University of Florida, Hispanics who are fluent in both English and Spanish can earn almost $7,000 more than those who only speak English. Similarly, bilinguals in the U.S. earn 7 percent more than monolinguals. Babbel, an online language learning program, articulates that speaking more than one language opens up career opportunities that are unavailable to monolinguals, such as jobs as translators, and in the education and healthcare sector. Financially, and according to Salary.com, bilingual employees can make between 5 and 20 percent more per hour than monolingual employees. Learning another language is one important key to occupational success. The time has never been better to learn a second, third, or even fourth language. The time to learn is now.